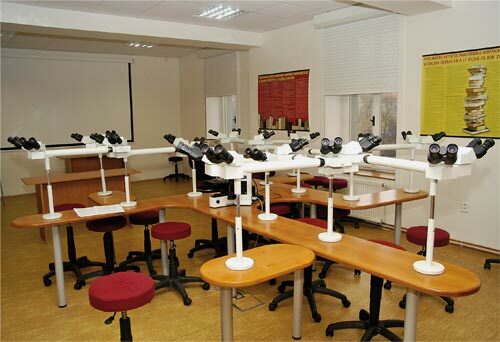 Facilities | ICDP-UEMS Dermatopathology Training Center | Services | Biopticka laborator s.r.o. Bioptická laboratoř s.r.o. was accredited by the ICDP-UEMS (International Committee of Dermatopathology= ICDP; European Union of Medical Specialists (Union Européenne Médecins Spécialistes = UEMS), as a Specialty Training Center in Dermatopathology in 2012 and re-accredited in 2016 (Program director: Prof. Dmitry Kazakov). 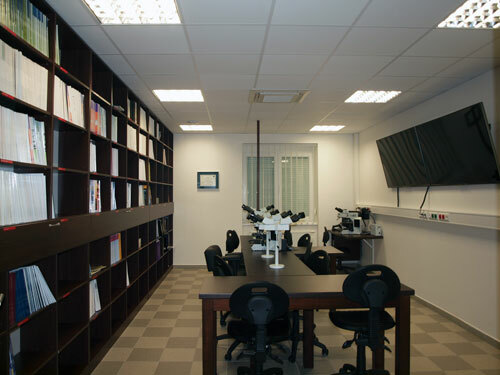 The Sikl Department of Pathology was accredited by the ICDP-UEMS as a Specialty Training Center in Dermatopathology in 2014 and re-accredited in 2016. 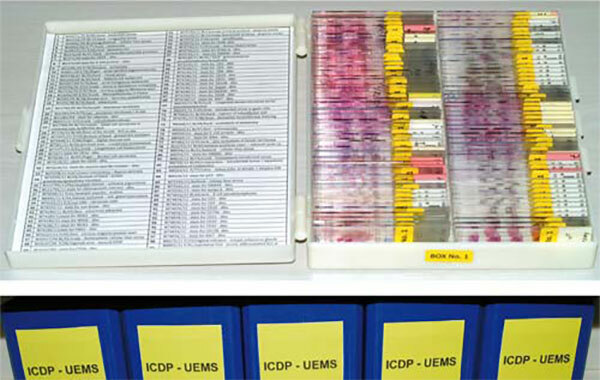 Certification ICDP-UEMS as "Specialty Training Center in Dermatopathology"
All routine and histochemical stain methods and over 400 primary polyclonal and monoclonal antibodies are used. 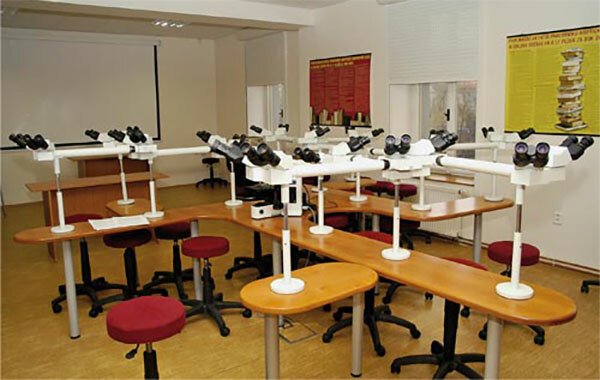 All trainees are provided with his/her own microscope for the whole duration of the stay located in the visitors' room (see Fig.1). Approximately 400 specimens, mainly blistering disorders are accessed each year. All cases are discussed with trainees during the sign-out sessions with Prof. Dmitry Kazakov, MD. All slides are scanned for retrospective studies, if needed. Molecular biology services are an integral part of both routine work and research and are provided by 11 molecular biologists and 5 technicians performing FISH, PCR, RT-PCR, sequencing (including NGS -next generation sequencing) and fragment analysis for the detection of chromosomal translocations, losses and gains, determination of clonality, analysis of loss of heterozygosity and detection of germline and somatic mutations or the presence of a particular infection. From July 2013, we have been using FISH for ambiguous melanocytic lesions and the visitors are welcome to observe the diagnostic process. 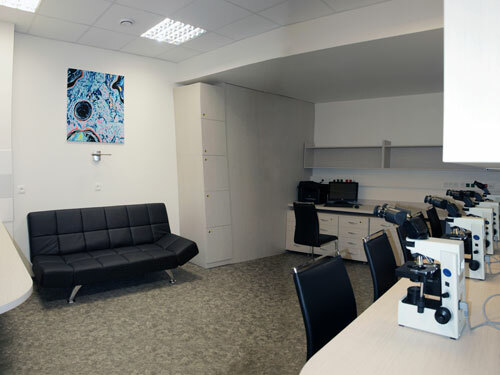 The detailed list of molecular biology services for dermatopathology is available at www.biopticka.cz. 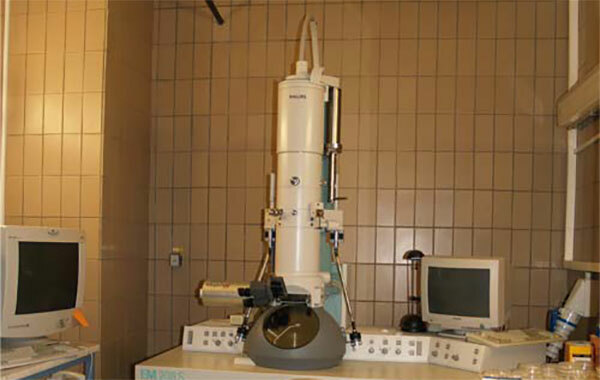 A Phillips electron microscope (see Fig.2) is located in the state faculty hospital to which trainees visiting the Dermatopathology Training Center have full access. Over 2 500 cases (see Fig.3) are available at present for self study. Apart from cutaneous specimens, some soft tissue, conjunctival, and oral lesions potentially encountered in dermatopathology practice are also included. 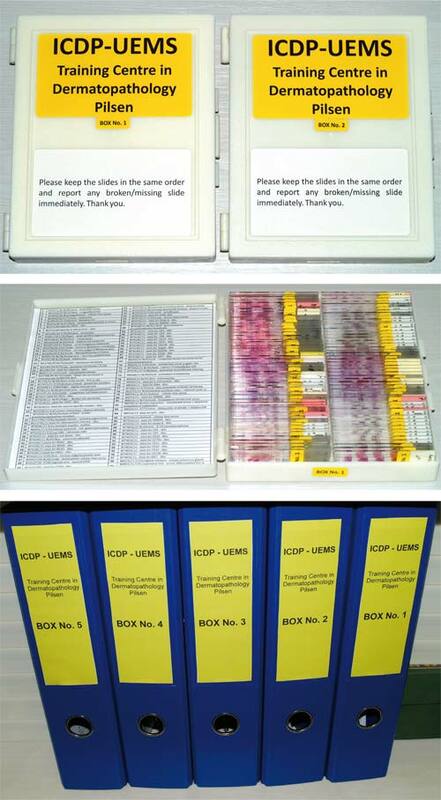 Presently, there are 40 boxes with mixed diagnoses and separate collections for melanocytic tumors, adnexal neoplasms, and lymphoproliferative disorders. For each case, a copy of a reference article or correspondent part of a textbook is provided. 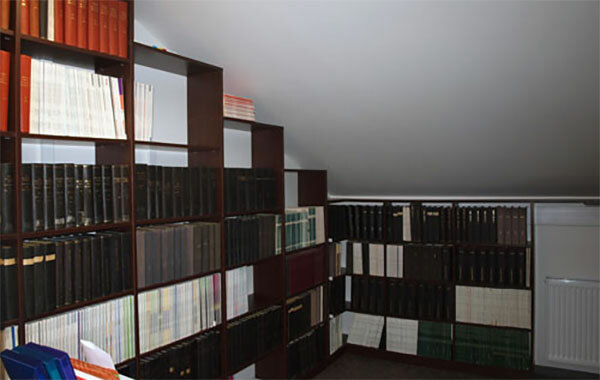 The collections are managed by Prof. Dmitry Kazakov and Dr. Liubov Kyrpychova. Additionally, trainees have access, per request, to the private slide collections of Profs. Dmitry Kazakov/Michal Michal and Dr. Michael Michal (soft tissue collection) and sets of past slide seminars. 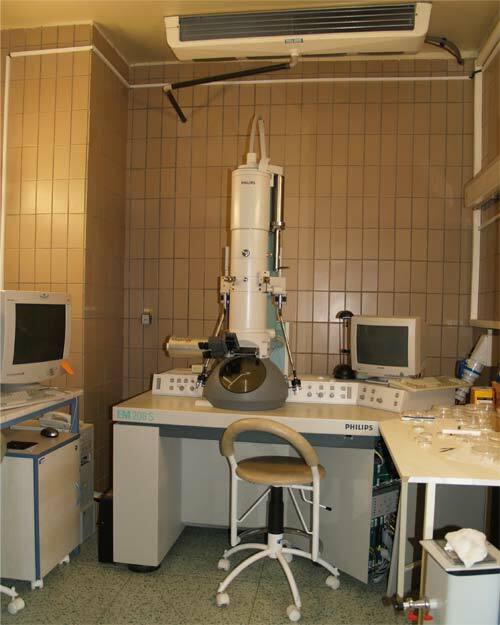 The training center is located in Bioptická laboratoř which possesses a 31-place multihead microscope (see Fig.4). For signing out in a less numerous group, there is a 9-head microscope (see Fig.5). 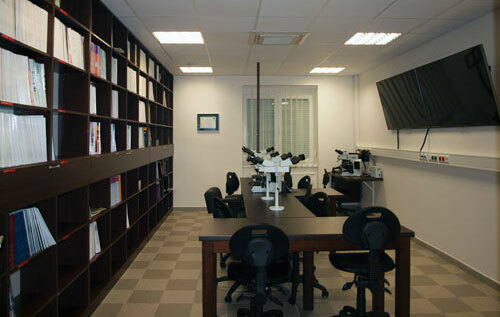 Our library (see Fig.6) contains all the principal dermatopathology, pathology and dermatology text books and journals. 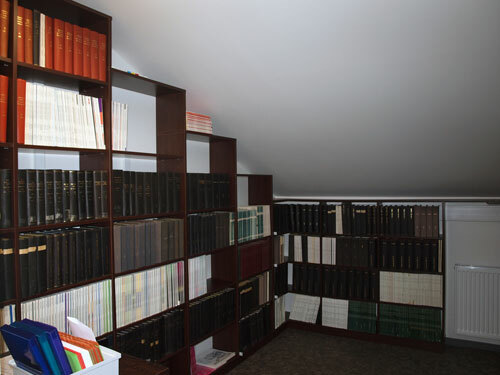 In addition to the hard copies, many journals can be accessed online. Additionally, there is a collection of more than 50 000 reprints, and by using the corresponding database particular articles can easily be found, and there is usually no problem in ordering a particular article via the University library for the remaining journals. 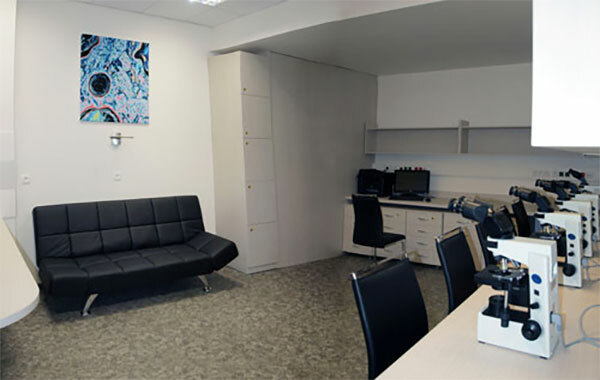 The private laboratory possesses several furnished apartments for visiting doctors which can be used by the trainees staying in our Dermatopathology Training Center. Availability should be discussed in advance with Mr David Michal (david.michal@medima.cz). Pilsen is the fourth largest city in the Czech Republic with 200 000 inhabitants, including the students of two universities, both of which are located in the city. Pilsen is situated 90 km south-west of Prague and 60 km from the German border and easily accessible by all means of transport. For more photos see Photogallery.